2.Practice wrapping the grip a few times with the adhesive covering on to get the hang of how far to start down the shaft. 3.Carefully peel back a little bit of the adhesive covering and place where the original grip started, near the center of the stick. 4.Sit with the stick across your lap. The handle should be to your right. This ensures the grip will be on the right direction. 5.You should start at the bottom and work you way up. The point of the tip should be facing away from you, pull the grip with your right hand in a downward motion. 7.Peel the adhesive as you go. 8.Once you get to the top of your stick cut the excess grip off and tape with electrical tape. You can also tape the bottom of the grip to secure it if you like. If you prefer a non-slip surface you can use hockey tape over the electrical tape. Two grips can be applied for added girth, but many players find better control with a thin handle. Remember to reapply electrical tape when it starts coming loose. A Chamois is an over-grip that provides a non-slip grip on the handle when wet, also used as a vibration dampener or to add girth to the handle. Used by top players who play on wet turf, in damp conditions, or to absorb sweat. 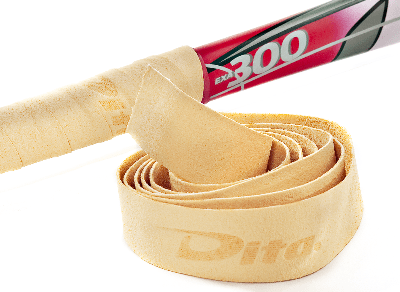 Dita chamois are genuine chamois material in its natural color. It is the same type of chamois used to spotlessly dry automobiles. 1. Apply over an existing grip. No adhesive is needed. 2. You can start at either the top of the stick or the center of the stick. 3. Place the stick across your lap with the handle to your right. 4. Place the Chamois at your desired starting point. Point the tip of the chamois away from you and pull the length in a downward motion with your right hand. Make sure your first rotation is very tight. 5. Continue wrapping applying even pressure the rest of the way. If you mist the grip with a little water while applying it may be a little easier to apply it. 6. Secure the grip with electrical tape at the end and top with athletic tape if desired. Some players like to also use tape at the center of the shaft, but if the chamois is applied correctly this is unnecessary.